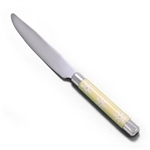 Dazee Sun by Pfaltzgraff, Stainless/Plastic Dinner Knife, Active Pattern: No, Circa: 2004, Blade Type: Serrated, Stainless, Size: 9", Yellow plastic handle with white flowers., The largest knife in the place setting, ideal for cutting your entrée. Dazee Sun by Pfaltzgraff, Stainless/Plastic Place Soup Spoon, Active Pattern: No, Circa: 2004, Size: 8", Yellow plastic handle with white flowers., Used for various types of soups and some desserts. Dazee Sun by Pfaltzgraff, Stainless/Plastic Teaspoon, Active Pattern: No, Circa: 2004, Size: 6-3/8", Yellow plastic handle with white flowers., Spoon found in place setting, used along with main entrée. Dazee Sun by Pfaltzgraff, Stainless/Plastic Salad Fork, Active Pattern: No, Circa: 2004, Size: 6-5/8", Yellow plastic handle with white flowers., Fork with cutting tine that is perfect for eating salads and desserts. Dazee Sun by Pfaltzgraff, Stainless/Plastic 5-PC Setting w/ Soup Spoon, Active Pattern: No, Circa: 2004, Blade Type: Serrated, Stainless, Size: Knife 9", Fork 8" , Salad Fork 6-5/8", Teaspoon 6-3/8", Place Soup Spoon 8", Yellow plastic handle with white flowers., Place setting including a knife, fork, salad fork, teaspoon and soup spoon.